In 2006, approximately 213,000 American women will be diagnosed with new-onset breast cancer and nearly 41,000 will die from this disease. 1 Appropriate screening and early detection remain the keys to decreasing this mortality rate. Recently, several new products have been introduced that were designed to help clinicians detect and treat breast cancer at the earliest possible stage, when the survival rate is the highest. One area of breast imaging that has received increased attention lately is magnetic resonance (MR) imaging. 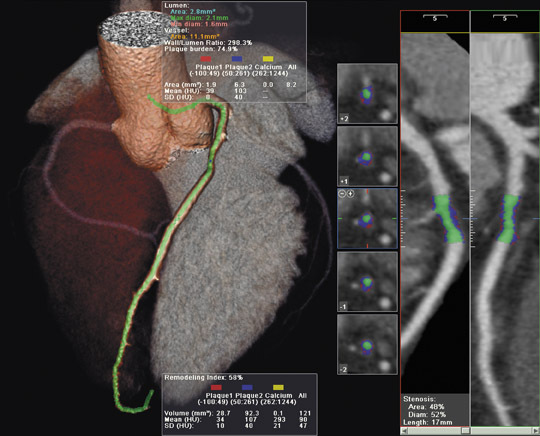 To assist radiologists in the reading of these extremely data-intensive studies, Invivo Corporation (Pewaukee, WI) recently introduced the DynaCAD (Figure 1), a digital imaging workstation with a computer-aided detection (CAD) system designed specifically for breast MR imaging. "With DynaCAD, we are looking at changes in signal intensity within the tissue over time," explained Bernadette M. Kaufman, RT(R)(MR), Product Manager, Breast Care, Invivo Corporation. "We inject patients with an MR contrast and watch the breast tissue perfuse and repeat the dynamic series over and over during the course of about 5 minutes and watch that enhancement over time." 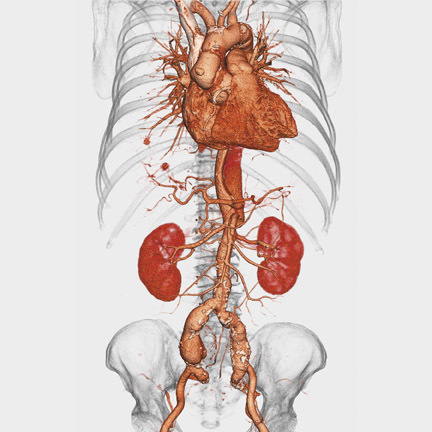 The system has 2 modules, one for diagnosis and one for interventional planning. "For the diagnostic portion of the study," Kaufman continued, "the radiologist is able to look at the data obtained from the dynamic sequence and map it into a curve to digitally observe the patterns and tissue behavior. Color overlays are added to the images to draw the radiologist's eye to areas of abnormal enhancement or increased signal." "The other portion is for interventional planning," she continued. "We can take a patient who has a known cancer, map out exactly where the lesion lies in reference to other anatomic structures or the chest wall, and insert either a wire or an interventional biopsy device, such as a semiautomatic gun, an automatic gun, or a vacuum-assisted device. The software allows this mapping to be done reproducibly and in a short period of time." The system provides automatic calculation of subtracted images, multiplanar reformatted images (MPR), and dynamic maximum intensity projections (MIP); 2-dimensional and 3-dimensional image registration for the correction of motion artifacts; and kinetic analysis tools (angiogenesis maps, time-intensity curves) for evaluation. The system also performs an automated search for regions of interest based on criteria set by the user. "Another thing that it can do is automatic subtraction," said Kaufman. "The breast is a fatty kind of tissue, and when we inject MR contrast into it and do a T1-weighted sequence, the lesion appears bright and the fat also appears bright. If we can subtract the precontrast from the postcontrast, what we end up with is the lesion isolated by itself that draws the radiologist's eye to any area of suspicion." The latest version of the software includes a Breast Imaging and Reporting Data System (BI-RADS) function and a histogram tool. "The histogram tool allows the user to take an area of interest and draw a volume around it," explained Kaufman, "and the system calculates the amount of enhancement within that volume. When monitoring neoadjuvant chemotherapy, this is important because you want to understand if the tumor is responding to therapy." "Bruce Porter, MD, of First Hill Diagnostic Imaging, Seattle, WA, is a well-known lecturer on the subject of breast cancer, and he talks about breast imaging less like imaging a body part and more like imaging a disease," concluded Kaufman. "And that is what this is all about. It's about not just getting the breast in there and taking a picture; it's about staging the exam; it's about being a company that provides a solution for monitoring the patient over the entire course of her disease." Suros Surgical Systems, Inc. (Indianapolis, IN) recently introduced a new vacuum-assisted breast biopsy system designed exclusively for use with MR guidance, the ATEC (Automated Tissue Excision and Collection) Breast Biopsy and Excision System Emerald Unit. "This was designed exclusively for MR imaging," said Tony Wibbler, Director of Marketing at Suros. "It's based on the core technologies that we use for the Sapphire and Pearl ATEC Units, but it eliminates some of the technology to allow it to be more economically advantageous." According to the company, this new system allows clinicians to perform MR-guided breast biopsies in 30 minutes or less, thereby freeing up valuable magnet time. It can be used with both the grid and pillar-and-post methods for lesion targeting, making it compatible with all leading magnet and coil manufacturers. "We found that many of our customers needed a second unit more than anything," explained Wibbler. "They needed one unit to do everything, so our key product, the Sapphire Unit, can be used with all 3 breast-biopsy modalities: ultrasound, stereotactic, and MR. But in some cases, that system is cost prohibitive. So, most of our customers now buy 2 units, the Pearl and the Emerald." Wibbler explained that some facilities need a second unit because of the geographic distance between the MR magnet and the other imaging modalities, while clinics that perform only MR don't want to pay for added technology that they cannot use. "The Emerald provides a great opportunity for those who don't actually perform ultrasound or stereotactic biopsies, such as freestanding MR clinics," concluded Wibbler. "This way they are paying for just exactly what they need." Despite the growing interest in a range of breast imaging modalities, mammography-both analog and digital-remains the gold standard for breast cancer screening. As more imaging centers begin to migrate to digital technology for mammography, however, the question of how to efficiently incorporate prior analog images into the digital workflow becomes more important. Many imaging groups are electing to digitize prior images and enter them into the picture archiving and communication system (PACS) to avoid having the radiologist move back and forth between a digital display and a lightbox when comparing a digital mammogram with a prior analog study. Typically, film digitizers consist of a scanner and a personal computer (PC) used to control it. Array Corporation USA (Hampton, NH) recently introduced a self-contained, tabletop, touch-screen film digitizer designed to be used without a PC controller, the 2908 MammoPro (Figure 2). "We believe it to be the first fully self-contained digitizer in the world," said Thomas J. Nardozzi, President of Array Corporation USA. "Most digitizers require a PC to control them that stands outside the actual device. With the 2908, the host PC is buried inside." The new compact unit features the same scanner that resides in the ImageChecker DMax CAD system for digital mammography from R2 Technology, Inc. (Sunnyvale, CA) (recently purchased by Hologic, Inc. [Bedford, MA]). It has a 50-micron resolution and an optical density range of up to 4.4OD. The system can scan both 18 × 24 and 24 × 30-inch films at a rate of 30 seconds per film for the smaller size. The DICOM-compatible system can also be used to burn CDs for image storage and portability. The 2908 MammoPro can be operated using the included touch screen; however, a mouse and keyboard are available as options. The entire unit measures approximately 26 inches wide by 33 inches high by 16 inches deep. "The 2908 MammoPro is devoted specifically to mammography," said Nardozzi. "There are other digitizers that are doing mammography, but dedication toward the proposition of high image quality as well as productivity is at the heart of what the 2908 is. It's good to know that the product has already been seen and accepted in the marketplace via the R2 products," he concluded, "and now the clients have an opportunity to access something very focused and dedicated specifically to the purpose of relevant priors." The company expects to begin product shipment this month. FUJIFILM Medical Systems USA, Inc. (Stamford, CT) and iCAD, Inc. (Nashua, NH) have signed an agreement under which Fuji will offer iCAD's SecondLook Digital and TotalLook products optimized for the Fuji Computed Radiography for Mammography (FCR m ) product line. "The agreement with iCAD allows Fuji to offer a comprehensive solution to our customers," said Andy Vandergrift, National Marketing Manager, Women's Healthcare at Fuji. "We plan to offer the standard-of-care iCAD products with our multiple digital mammography solutions." "We believe there are significant cancer detection and workflow benefits to combining digital mammography with computer-aided detection," added Ken Ferry, President and CEO of iCAD, "and our newest version of SecondLook Digital for Fuji is specifically optimized for FCR m . iCAD's computer-aided detection has been shown to find cancers at an earlier, more treatable stage, helping to improve patient care and reduce costs." Technology and Industry: Advances in breast cancer detection. Appl Radiol.